Points West Living Red Deer’s new General Manager isn’t new at all. In fact, Tracy Sutherland has been involved since the PWL Red Deer first opened in the summer of 2016. She began as Hospitality Manager and has been putting her experience in hotel customer service to great use ever since. Tracy Sutherland grew up in Bowsman, a tiny Manitoba village close to the Saskatchewan border. She lived with her mother but spent a lot of time with both sets of grandparents. Her maternal grandparents farmed and ran the local stationery store in town. And she was close to her paternal grandmother, a Dutch war bride. With all that family around, including cousins, aunts, and uncles, Tracy felt well grounded in Bowsman, but as soon as she graduated from high school, she was ready to spread her wings. Those wings took her to Alberta where she landed her first job in Red Deer, working the drive-through window at Arby’s. Tracy gravitated to the hotel industry, where she started as a front desk clerk and worked her way up to manager. She stayed in that industry for 22 years, half of it in management positions. “If something needed to get done, I would do it,” Tracy says. And that attitude, along with a genuine desire to connect with people eventually led to her joining Points West Living as a ‘Hospitality Manager’ when PWL Red Deer opened in 2016. In the fall of 2017, Tracy was named Interim General Manager, and in January 2018, she became PWL Red Deer’s General Manager. 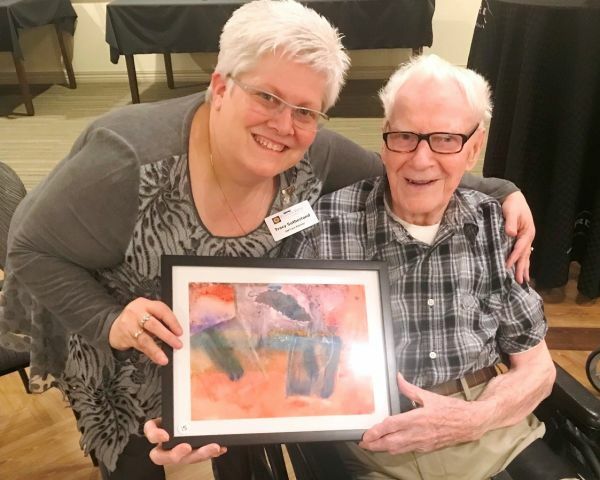 Photo: At a recent residents’ art auction at PWL Red Deer, General Manager Tracy Sutherland purchased a painting done by memory care resident John Hebert. The piece is called Waterfall.